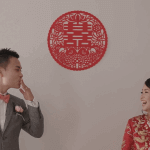 Our work on filming Alex & Baillie’s exciting summer wedding day began in the early hours of the morning, with our videographers and cinematographers arriving at the bride’s house for the beginning of the traditional Chinese wedding day door games. An ever-joyful experience between bridesmaids, groomsmen and the bride & groom to be, our videographers and cinematographers luckily captured the first few minutes of the door games, and showcased all the fun in our included highlight reel and same-day-edit. It’s always interesting featuring the door games in our same-day-edits during the evening’s reception, as it gives our work a certain sense of completion, and provides a chance for the bridesmaids and groomsmen to look back on the day and – of course – explain themselves during the speeches (that’s always fun to see). Also included was, of course, the most important exchange of words for the day, and an ever-favourite of our videographers and cinematographers; Alex & Baillie’s recitation of their solemn vows together, in a beautiful bright summer wedding ceremony held at the always breathtaking Casa Loma, one of Toronto’s hallmark destinations – a Gothic revival castle at the heart of Toronto’s midtown and right at the centre of the Greater Toronto Area. In our included highlight reel and same-day-edit, you can view a lovely scenic shot of Casa Loma’s glorious gothic edifice as it faces midtown Toronto’s skyline, an example of one of Toronto’s spectacular cityscape contrasts; of the eclectic blending of old and new to form something vibrant and beautiful. Working in Casa Loma has been very special four our videographers and cinematographers in the handful of times we’ve filmed there. The historic Casa Loma is one of Toronto’s most distinct landmarks, and a favourite destination for both tourists and Torontonians alike. A gorgeous Gothic Revival edifice in the heart of Toronto’s midtown, the beautiful estate was constructed in 1914 as a private residence for Canadian financier Henry Pellat, who auctioned the house after World War I, from which it operated as a luxury hotel till 1933, when the city of Toronto purchased and renovated the estate, leasing it to the Kiwanis Club of Casa Loma till 2011, when it was purchased by the Liberty Entertainment Group. Over these years, all 343,253 square feet, seven floors and 98 rooms have served Toronto as one of its finest architectural works, and one of Toronto’s favourite historic sites. Today, it’s a premier location for couples to host their wedding, solidifying their marriage by being a part of Toronto’s historic legacy, and immersing themselves in a truly trademark Torontonian experience. With a solemn vow shared to the applause of the crowd, a tearful Alex & Baillie brought forth an unbelievably magical moment in the completion of their wedding ceremony in full view of our videographers’ and cinematographers’ cameras, drawing a dream fulfilled for the now-newlywed couple. 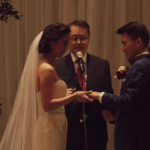 An interesting departure from our usual traditional Chinese wedding day template, Alex & Baillie had chosen to host their traditional Chinese tea ceremony at the beautiful Bellagio Boutique Event Venue in Vaughan, just a stone’s throw away from our initial midtown Toronto location. 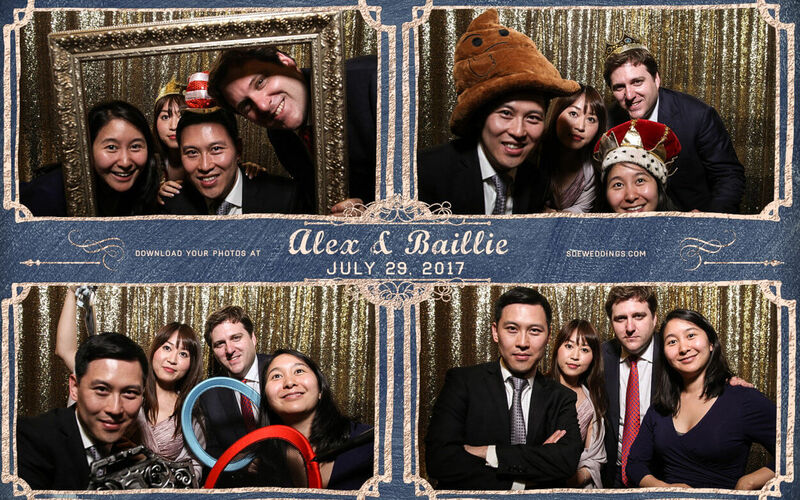 From an ode to tradition in hosting a tea ceremony, to the celebration of life and the future in their reception and celebration, Alex & Baillie’s evening would be one for the ages. 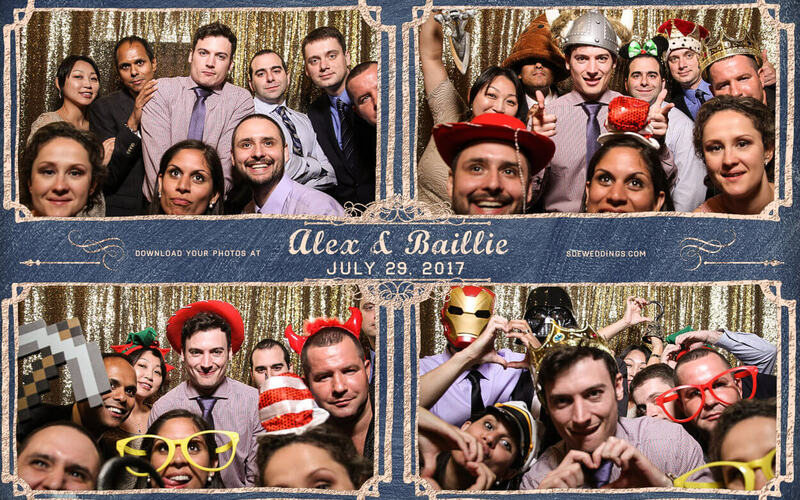 With our videographers’ and cinematographers’ same-day-edit highlight reel featured lovingly at the celebration, and a photobooth setup care-of our videographers and cinematographers to keep the late hours of the night as exciting as ever, our wedding experts at SDE Weddings were dedicated to bringing the most wonderful wedding celebration experience to life for Alex & Baillie. 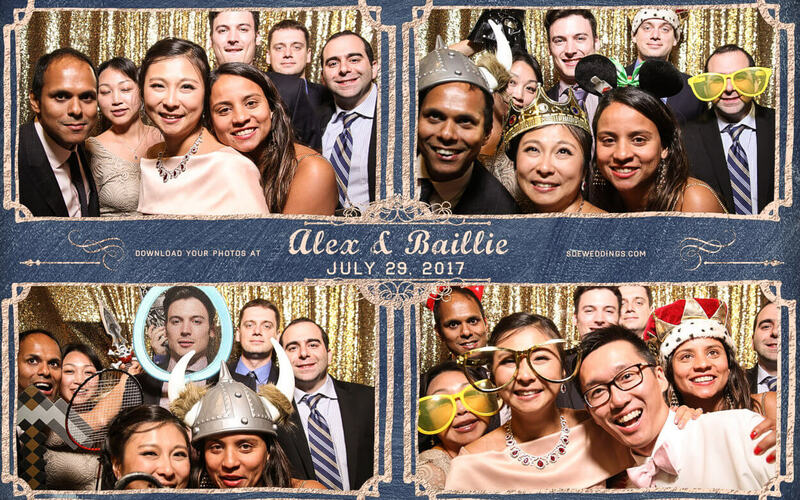 And with our same-day-edit highlight reel a resounding hit with the crowd, we couldn’t help but be pleased with our work, and pleased with just how perfect Alex & Baillie’s wedding day had been. 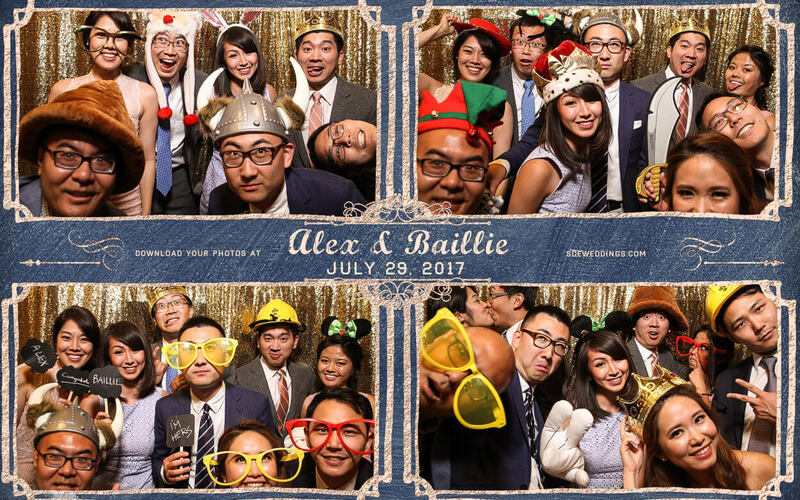 So in short, we here at SDE Weddings, Toronto’s premier wedding videography, cinematography and photobooth group, wish Alex & Baillie all the very best in their newfound future together as husband and wife. 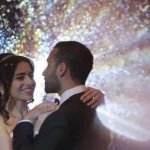 Our videographers and cinematographers thank them truly for providing an opportunity to let our talents shine, and a chance to create a magical timepiece from a genuinely magical wedding day. From the morning’s hilarious Chinese door games, to the late night celebration and same-day-edit showcase, our videographers and cinematographers had a handful all throughout the day; with every moment made worth the effort in the end. 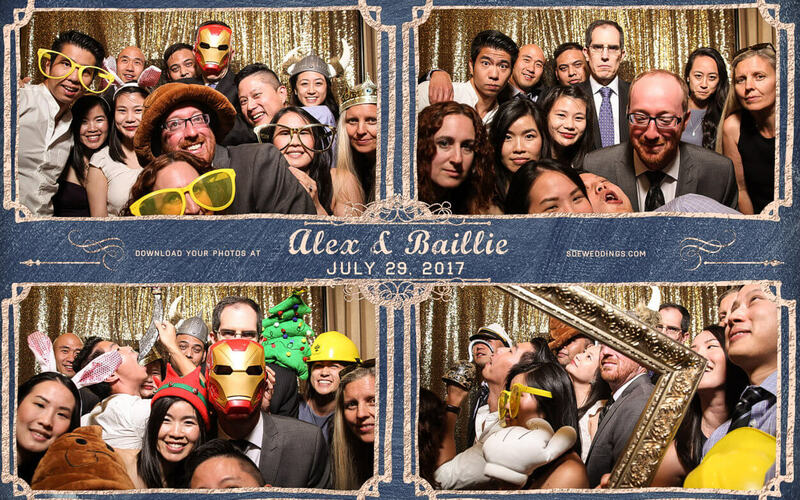 We hope that our work with Alex & Bailley on their wonderful summer season wedding ceremony and celebration is enough to stand the test of time, and always serves as a reminder for them that variety (and videography!) is the spice of life. 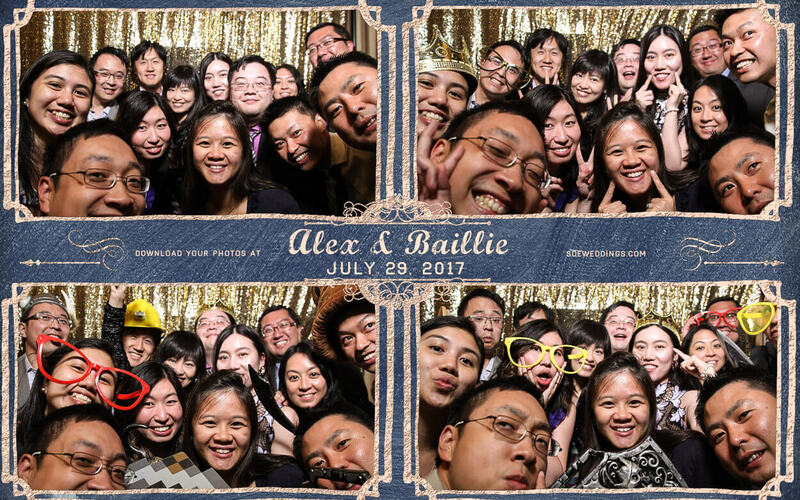 Here are our photo booth photos from the Chinese wedding reception at the Bellagio Boutique Event Venue for Alex & Baillie.